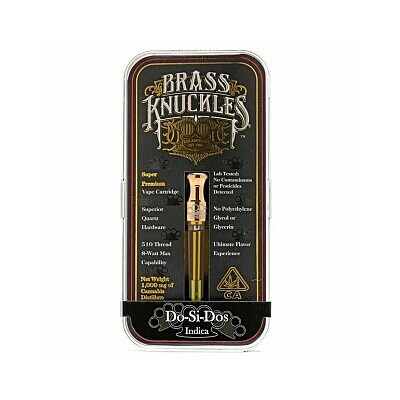 Swing yer partner and enjoy the incredible flavors and potent effects of Brass Knuckles’ Do-Si-Dos Cartridge. Brass Knuckles extraction artists begin with premium Do-Si-Does flowers, capturing the strains essence both in taste and experience. A few puffs of this cartridge delivers a complex yet complementary terpene profile, expressing sweet notes with lime, mint, pine, and spice. This cartridge will leave you with a soaring mood and in deep euphoria as the soothing body-high delivers penetrating relaxation.